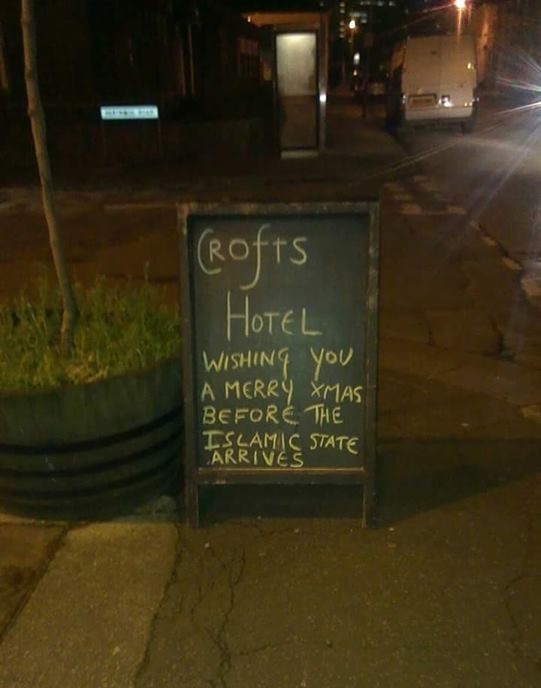 This sign appeared outside The Crofts pub in Roath, Cardiff. Members of far-right party the National Front tried to disrupt a peaceful march of more than 500 Muslims from across Wales in Newport today. 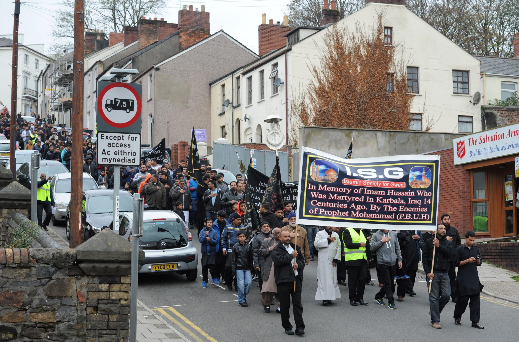 The annual march, organised by the Islamic Society of Wales, commemorates the anniversary of Prophet Mohammad’s grandson, Imam Hussain, who was martyred more than 1,300 years ago. The 32nd march to be held in Newport should have taken place last Sunday – the 10th day in the Muslim calendar – but was put back so the city’s Muslims could join in the Remembrance Sunday services. 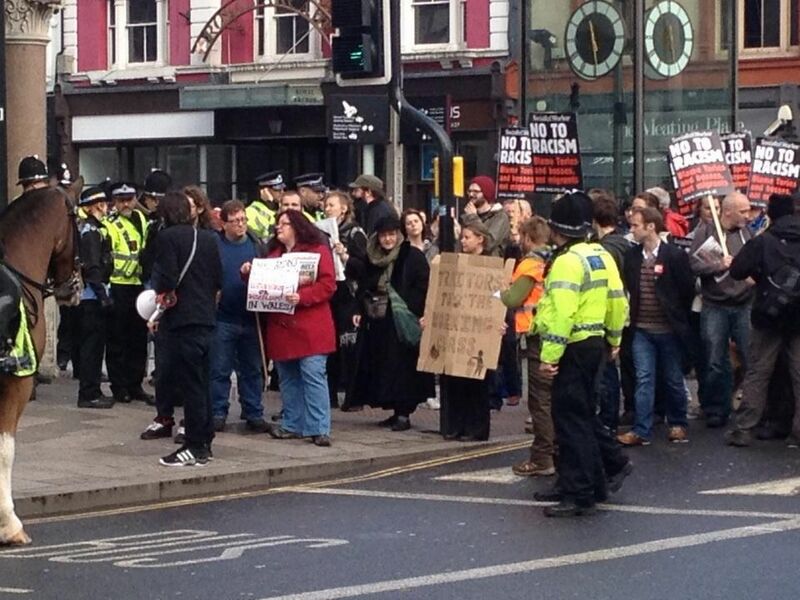 But yesterday afternoon police stepped in when anti-Muslim protestors attempted to disrupt the peaceful march. As the hundreds of men, women and children walked along Commercial Street, two men carrying National Front flags attempted to enter the crowd from a side street. They were joined by six more protestors who held up British and Welsh flags and shouted abuse including, “These are our streets” and “Muslims, burn in hell”. Officers from Gwent Police and private security firms formed a barrier around the men. Two of the men were later seen in the Red Lion pub on Stow Hill, shouting abuse from inside while police blocked the entrance. Police officers have lined the streets of Cardiff city centre, where a demonstration by a group called the Welsh Alliance is taking place. Anti-fascist protesters have gathered in the city centre in protest of the march, which is set to end at City Hall this afternoon. Beforehand, members of the Welsh Alliance gathered at pubs near the city’s Mill Lane and bottom of St Mary Street, where they were advised by on their Facebook group: “no banners, flags or chanting inside please”. Members were told to gather in front of Cardiff Central Station before marching to City Hall for speeches. The Facebook group advised “please leave any racist banners at home”. The group claim on Facebook they are “Welsh patriots” who are “fighting mass immigration”. Anti-fascism protesters gathered at the bottom of St Mary Street with their own banners to counter the demonstration in “a united front” to show “racism in any guise in not accepted in Cardiff”. One campaigner opposing the Welsh Alliance was Mia Hollsing, 26, from Mountain Ash. She said: “I think there’s a lot of police here, a bit too many in my view. “We need a diverse society where everyone is welcome regardless of where they are from and what they believe in. It the rich people that are causing the problems in this country, not ordinary workers, wherever they come from. We are here peacefully – none of us are violent. 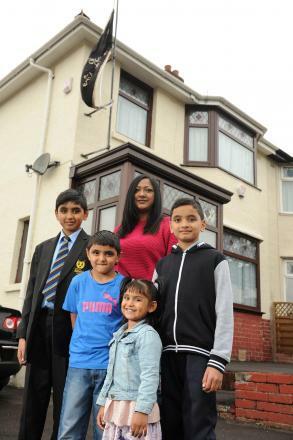 Shazia Ramzan, 35, shocked her neighbours when she raised what looked like the black flag of jihad in her street. Passers-by threatened to call the police after Prime Minister David Cameron said anyone seen with the Shahada flag should be arrested. But mum-of-two Shazia said it was not the same banner used by the terrorist organisation – and she branded IS as “scumbags”. Muslim communities across Newport are being urged to report hate crimes, with a focus on incidents targeting religion and faith. 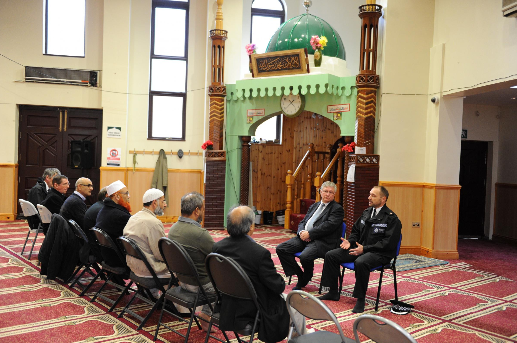 Gwent’s Deputy Police and Crime Commissioner Paul Harris and Gwent Police Superintendent Mark Warrender met Muslim community leaders yesterday during hate crime awareness week. A recent hate crime survey in Wales found 15 per cent of religious hate victims had attempted to conceal their religion to reduce the risk of victimisation. And Superintendent Warrender, the force’s lead officer for hate crime, said of 250 hate crime incidents reported in Gwent every year, just a handful are linked to religion and faith. “The numbers don’t reflect what is going on. We are trying to get more people to come forward and there are lots of different reasons why they don’t,” he said. A Cardiff mosque has been forced to close after being smashed up by intruders. 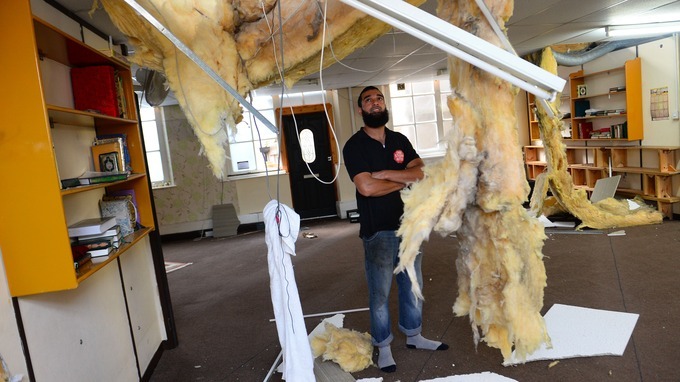 Police are investigating after the Rabbaniah Islamic Cultural Centre suffered thousands of pounds of damage after burglars pulled down the ceiling and ripped charity boxes from the walls. The cultural centre in Grangetown was completely wrecked by the intruders who stole at least £4,000 of money stored in charity collection boxes and locked safes containing wages for staff. The burglars first broke into the main hall but then rampaged through the mosque and cultural centre – tearing down the internal roof to get up to the office on the first floor. Computers were stamped on, CCTV cameras were pulled from the walls and doors have been kicked through. Complaints have been made after a Torfaen councillor used the term “muzzy” in a post on Facebook – but he denies the comment was an anti-Muslim slur. 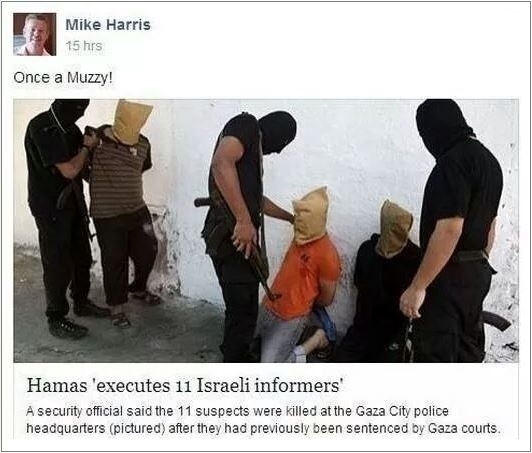 Torfaen independent councillor Mike Harris, the chairman of safer communities overview and scrutiny, posted “Once a Muzzy!” on Facebook alongside a Daily Mail article on Hamas reportedly executing 11 Israeli informers. 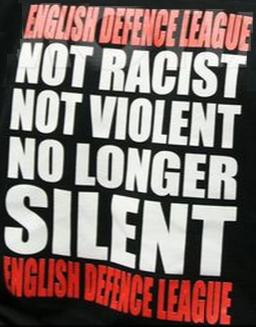 This was quickly picked up by Hope Not Hate campaigners who posted it on their blog and Facebook page. One person responded that Cllr Harris should step down, while another says that they made a complaint to Torfaen Council. 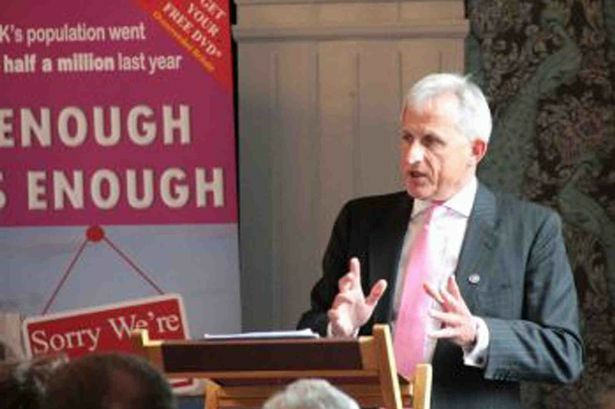 But Cllr Harris has defended his post saying “it is not racist”. He denies that it was intended as a racist slur but that he was using the word in its proper meaning as set out in the dictionary, “Unable to think clearly; confused”. A man entered a shop and told its Muslim owner “I’m a racist and I kill Muslims,” on the first anniversary of the death of soldier Lee Rigby. Daniel Lee Lewis, of Church Street, Wrexham, entered the shop on Chester Street in Flint after midnight on May 23. He asked the owner where he was from and if he was a Muslim. The owner replied he was Turkish but had an English passport and told Lewis he was Muslim. Lewis told the owner: “It’s alright, I won’t cause any trouble. It’s my country, I will do what I want. I’m a racist and I kill Muslims.” He spat on the shop floor and invited the owner outside for a fight. But the police had been called and he was arrested. The 32-year-old told police: “It’s one year today to the death of Lee Rigby, there will be thousands of us in Manchester on Saturday,” before chanting EDL [English Defence League] at them. Appearing at Wrexham Magistrates Court yesterday, Lewis pleaded guilty to using threatening or abusive words or behaviour with intent to cause racially aggravated fear of or provoke unlawful violence. He also admitted failure to surrender to bail.